With a crown of stiff gold-coloured feathers on its head, a bright red gular sac and body made of gray, brown, gold and white patches, the grey crowned crane stands out for its striking features. Commonly called the crested crane, it is a bird of national significance to Uganda, occupying a prime position on the country’s national flag and coat of arms. Yet despite its serenity, beauty and popularity, the crested crane is facing the threat of extinction. “Records show that the population of the cranes has crushed in the past four decades — by over 80 per cent,” said Achilles Byaruhanga, the executive director of Nature Uganda. 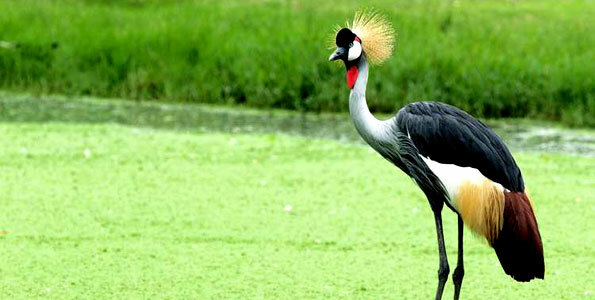 Once widespread, only about 10,000 to 20,000 gray crowned cranes are left in Uganda, compared with an estimated 100,000 four decades ago, according to statistics from Nature Uganda and the Ministry of Tourism and Wildlife. There are up to 15 species of the gray crowned crane worldwide. Two subspecies are predominantly found in Africa, with a large distribution of the East African crested crane — scientifically called Balearica regulorum gibbericeps — found in Uganda, Kenya, Tanzania, Rwanda, Burundi, Democratic Republic of Congo and Mozambique, while the Southern African species (Balearica regulorum regulorum) is largely found in South Africa and Zimbabwe. “The East African sub-species is experiencing a long-term population decline and a rapidly contracting area of occupancy,” said Paul Mafabi, director of environmental affairs at the Ministry of Water and Environment. This decline, he says has been recorded right across the East African region. In Kenya, for example, Mr Mafabi said crane numbers stand at between 20,000 and 25,000, down from 35,000 three decades ago, while fewer than 1,000 crested cranes are found in each of the other East African countries of Tanzania, Rwanda and Burundi. In 2012, this decline saw the International Union for the Conservation of Nature (IUCN), put the gray crowned crane on its list of endangered bird species. Several factors have contributed to their declining numbers, but one reason stands out: Habitat loss. Conservationists say habitat loss has had a particularly negative impact on crane numbers over the years because a number of seasonal wetlands and swamps where the birds nest and breed have been converted into agricultural land or used for other development projects. Most crested cranes live in mixed wetland habitats, on riverbanks, around dams and open grassland. As a result, they often forage on agricultural lands, which are close to wetlands or riverbanks, feeding on grass seeds, small toads, frogs, insects and other invertebrates. “Because of this foraging lifestyle, the crested crane has easily adapted to human settlements, with many living side-by-side with human beings,” said Mr Mafabi. It is this easy co-existence with humans that is putting the cranes’ survival at risk. He added that the low reproductive rate of the crested crane, frequent hunting and capture of young ones or their eggs have also had drastic consequences for their numbers. “Because of their exceptional beauty, many people are also increasingly capturing the birds and domesticating them as pets,” said Mr Mafabi. Cranes nest in one location, often laying between two and five eggs that are incubated by both sexes for anywhere between 28 and 31 days. The monogamous nature of the cranes has also partly contributed to their low numbers. “The crested crane is a highly monogamous bird, which pairs once, for life. This means that if one of them is killed or domesticated, the likelihood of finding a new mating partner is almost non-existent,” said Mr Mafabi. Cranes do not breed in captivity. To reverse the declining numbers of the cranes, Nature Uganda, which has been documenting and researching on the crane for the past 30 years, has launched an initiative it hopes will change the status quo. It seeks to raise up to Ush1.2 billion ($352,464) over the next five years to conserve and restore key crane habitats including wetlands and water catchment areas to provide a nesting place for the birds.